Professional mural artist Patricia Buzo has always had a passion for the arts, and has trained at some of the country's finest art facilities. She began her journey when she was just 13 years old when she attended her first painting class. As she realized her talent, she made the decision to finish high school at home, enabling her to study fine art full time. For the next four years she studied drawing and painting, learning from the work of the great masters such as William Bouguereau, John William Godward, and Giambattista Tiepolo. In 2001, at the age of 21 she founded her own decorative painting business she called Patricia's Palette. 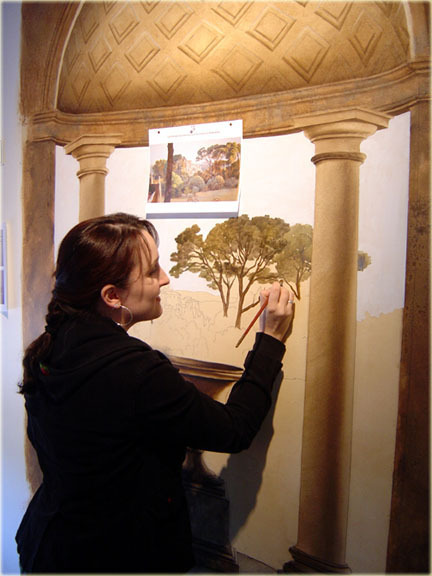 Patricia's expertise lies in decorative finishes such as fine faux effects and trompe l'oeil murals, and has had the opportunity to teach trompe l'oeil, stenciling, and color theory classes. Starting in 2003, she used her talent to benefit local and national charities including Saint Bart's school located in Wayzata, as well as the Starkey Hearing Foundation for which she won WCCO Radio's 'Good Neighbor Award' in July of 2004.